I've noticed a trend in my garden this year. Due to a warmer, wetter spring everything has been really early. My fall blooming plants are already blooming, and quite a few of my summer plants are done. 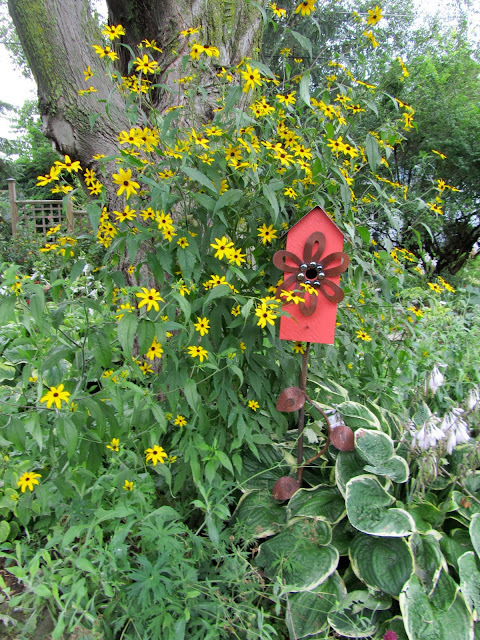 Blooming in my garden right now are black eyed susan, obedience plant, and hibiscus. I wonder what's going to be left in fall? I hope my monkshood and my fall blooming crocus don't start blooming soon, or I'll have nothing to look forward to. What a beautiful picture this is! Love the birdhouse it is a perfect focal point for this beautiful scene. Wow, that is a lot of rain. By the way I love the slideshow. Very cool!